In its inaugural year as a locally-produced event, the new organizers of Telluride Gay Ski Week are taking it up a notch with more provocative entertainment and broadened community outreach. Scheduled for Saturday, February 20-Saturday, February 27, this year’s event is packed with an impressive list of special guests, including Olympian Gus Kenworthy, musician Shawn Colvin, comedian Sandra Bernhard, and the infamous DJ Ruckus, among others. “We are very happy to have Gus getting back to his hometown to help us kick off the week as Telluride Gay Ski Week Ambassador 2016,” said TGSW organizer/director Rosie Cusack, who is co-producing the event with Soiree Telluride owner and event planner Wendy Hampton. The two women have made a point of infusing the week-long event with top-notch talent that should appeal to locals and visitors alike. Telluride native and hometown hero Gus Kenworthy is a fitting TGSW ambassador. Here is a link to Gus’s moving interview with ESPN about coming out. The charismatic 25-year-old is a freestyle skiing celebrity, having won a silver medal in the 2014 Sochi Winter Olympics. Kenworthy, who continues to dominate halfpipe and slopestyle events around the world – (Kenworthy just took silver at the recent X Games) –came out as gay in October 2015. He is the first action sports star to come out, according to Rolling Stone. 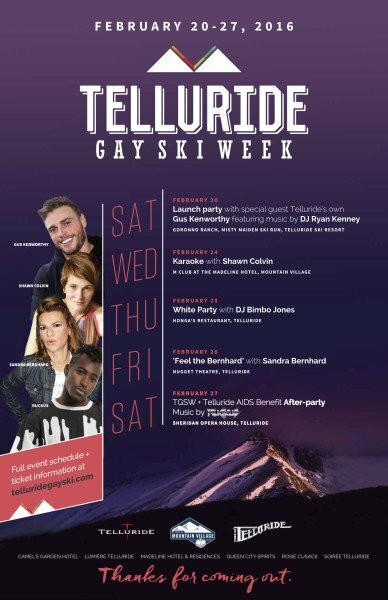 Gus Kenworthy helps launch 2016 Telluride Gay Ski Week on Saturday, February 20 with a dance party at Telluride Ski Resort’s Gorrono Beach. Between ski runs, guests get to eat barbecue and groove with Kenworthy and international DJ/producer Ryan Kenney on the outdoor deck. Then the party moves to downtown Telluride, where Arroyo Gallery and Wine Bar hosts Gay Ski Week’s Opening Cocktail Party at 8 p.m., featuring Telluride’s own DJ Ryan Smith. That is followed by TGSW’s Pop-Up Night Club at 10 p.m., a boutique dance club at La Marmotte, again featuring DJ Ryan Kenney. Kenworthy will be present at both events and at Sunday’s coveted Après Ski Pool Party at Madeline’s Sky Terrace, where DJ Soul Atomic will be spinning tunes. “This will be the first public event at the new pool on Hotel Madeline’s new Sky Terrace,” said Hampton. After Sunday, Telluride Gay Ski Week participants have a few days to ski and take advantage of local offerings such as fat tire bike tours, sleigh rides, yoga classes, and snowmobile tours. Each day of the week features designated excursions and activities, as well as restaurant and bar specials for TGSW patrons. Look for lunches, après ski gatherings, cocktail parties, and dinner specials both on the ski mountain and throughout the Towns of Telluride and Mountain Village. Come Wednesday, February 24, 9 p.m., Gay Ski Week presents a one-of-a-kind evening of karaoke with Grammy-Award winning singer/songwriter Shawn Colvin at Hotel Madeline’s M Club. Thursday, February 25, following the Telluride AIDS Benefit Sneak Peek Fashion Show, Gay Ski Week brings back its wildly popular White Party, featuring the infamous DJ Bimbo Jones. That event takes place Honga’s at 10 p.m. As one of the most anticipated events of TGSW, this party is not to be missed. After a day of skiing, yoga, and spa time on Friday, February 26, TGSW participants are encouraged to attend the annual the Telluride AIDS Benefit‘s Silent Art Auction at the Sheridan Opera House Gallery. Then, round the corner to “Feel the Bernhard” at the Nugget at 9:30 p.m. New York City comedian Sandra Bernhard is making a rare Telluride appearance to present her brand new show. Should be a riotous, irreverent evening. On Saturday, February 27, the week of fun, skiing and dancing culminates in yet more dancing, when TGSW and the Telluride AIDS Benefit co-present the legendary DJ Ruckus at the Sheridan Opera House at 10 p.m. Think: specialty cocktails, amazing lighting, and ambiance, lounge vignettes, a VIP Lounge, and Girls a GoGo/Boys a GoGo, not to mention killer music. “DJ Ruckus is huge. He’s one of the world’s biggest DJs,” said Hampton, noting the event doubles as TAB’s Saturday night Gala Fashion Show after-party. Described as “New York Fashion Week meets Cirque de Soleil,” the TAB Benefit Fashion Show features an eclectic mix of local models flaunting international designer fashion on the Telluride Conference Center runway, all in support of TAB’s seven beneficiaries from Colorado to Africa. TGSW is also collaborating with as many locals and local entities as possible to produce this year’s event, including Telluride Ski Resort, the Towns of Telluride and Mountain Village, local DJs, and many other vendors. This year, instead of a printed schedule, the promoters have created an interactive, mobile-friendly website. So all you need is your phone, your skis/boards—and your best party outfit(s). For a complete Telluride Gay Ski Week schedule, pricing, tickets and up-to-the minute happenings, go to www.telluridegayskiweek.com. For information and tickets to the Telluride AIDS Benefit, visit wwwtellurideaidsbenefit.org.